Grace Groner lived an ordinary life. She became an orphan at the age of 12 and was taken in by a member of her small farming community. She never got married or had kids. While she travelled extensively, Grace never owned a car and she worked as a secretary her entire career. She lived a quiet life in a one-bedroom apartment. She became famous after her death in 2010 at the age of 100 when the New York Times reported that she left a staggering seven million-dollar fortune to her alma mater, Lake Forest College. By all accounts, Ms Groner was close to Lake Forest during her life. She donated $180,000 to help start a scholarship fund and attended college football games. Prior to her death she established a foundation and expressed her desire that the income from her estate should be used to benefit students of Lake Forest College by funding independent study, internships, international study and service projects. It was estimated that the foundation would earn $300,000 a year and some 1,300 students will benefit from her foundation. 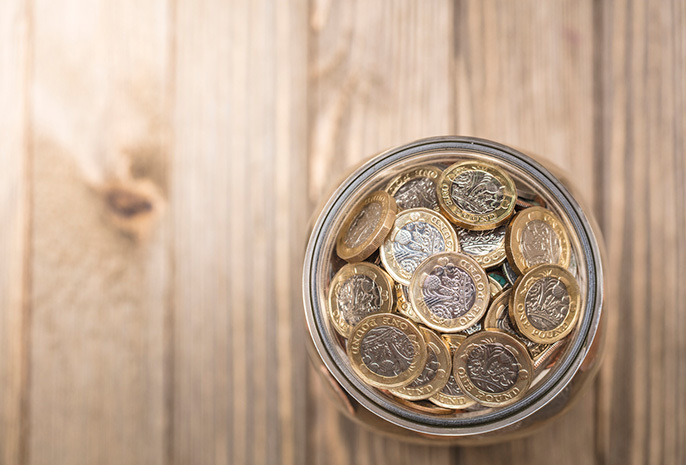 Here’s the question, how does a humble secretary end up with a fortune of seven million pounds? In the months after her death, the media kept asking the question ‘where did Grace get all that money?’ Surely, there must be some secret to accumulating that much wealth? As it turns out, there was no secret. Grace lived a frugal life. She saved as much as she could from her meagre salary. She invested in the stock market and allowed the compounding interest rates to do the rest. 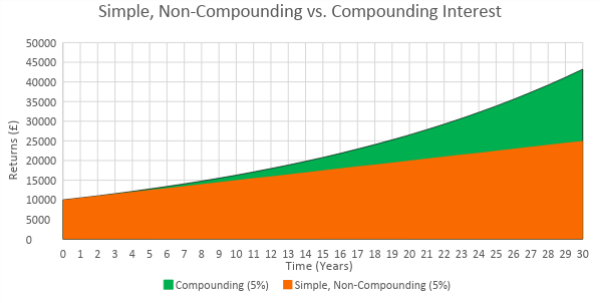 An interest rate of 5% per annum, compounding over 30 years (see above) delivers a return 72.88% more, compared with a simple non-compounding investment. The point of this story isn’t to suggest that we should necessarily emulate Grace’s life, although there’s nothing wrong with that. Rather, it is to point out the incredible power of compounding. Grace invested in stocks and share. The shares provided dividends which she reinvested. She wasn’t timing the market or reading the newspapers for stock tips or looking for a fund manager that will beat the market. She just invested and stayed invested. She allowed the power of compounding to work for her. Crucially, she never interrupted that process of compounding. Many investors make things harder than they need to be. They trade too much. They read the newspapers for stock tips given by ‘gurus’ who know nothing about their personal circumstance. They are constantly trying to predict which sector will do well next year and which one to avoid. This is one reason why at Tandem, we keep changes to our investment process to the barest minimum. We recognise that the capital markets almost always reward patience. We encourage our clients to avoid unnecessary interruption to the process of compounding. This, we believe, is the most effective way to build wealth in the long term.